In Super Mario Combat our little plumber fights with his fists and tries to beat his opponents. Can you make it to Bowser to defeat the big turtle? The princess needs saving and cannot escape alone. The game is played using the keyboard. First, use your mouse to select 'Play game' and you will immediately enter into the world as Mario. Use the 'left' and 'right' arrow keys to run. Use the 'up' arrow key to jump and and use the 'A' key to strike. Pressing the down arrow key and the letter 'A' simultaneously leads Mario to perform an uppercut. If you strike several times throughout the run he makes a forward-facing attack. From the second map onwards, the passages Mario has to reach are quite difficult. To get to them, click the 'up' arrow during a jump and then he will perform a Wall Jump. The game ends when you have killed Bowser. The game is designed very nicely and that Mario can punch makes me kinda happy. Unfortunately, there are not very many levels and it would have been better if the game would take a little longer. Nevertheless, Super Mario Combat is playable and adds a little variety to the dull, everyday Jump'n'Run games. Do you like Super Mario Combat? 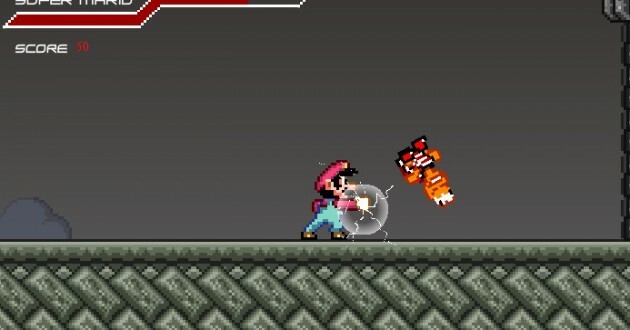 If you like Super Mario Combat, please click on the Facebook Like Button. With help of the likes on games, we generate our top 10 charts.